The Steam page blurb for The Last Tinker: City of Colors lists Banjo Kazooie as one of the games inspirations. This colorful adventure certainly shares some spirit with the bear and bird (in this case a monkey and sheep), but the title that it brought to mind for me was the original Spyro the Dragon. Although it never reached the critical heights or gameplay complexities of Banjo Kazooie, Spyro was nonetheless an important jumping off point for a lot of younger gamers. 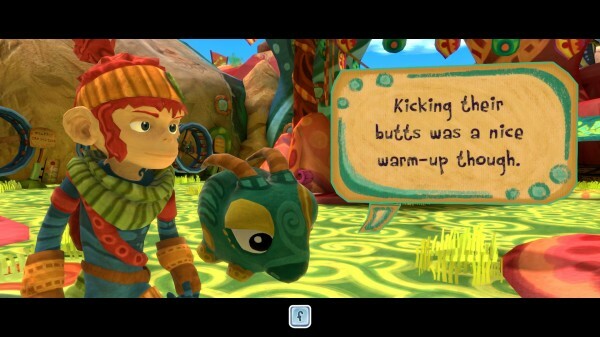 The Last Tinker inspires the same sort of feeling, and the simple combat and story do mark it as something of a kid’s game. That said there is an instant death difficulty setting, so don’t be in a hurry to write this off as something purely for the young’uns. The game is fully compatible with the Xbox 360 gamepad, and you can check out CC’s preview of it here. The Last Tinker takes place in Colortown, a city where the Reds, Greens, and Blues used to live in harmony. Now they are divided, barricading themselves in their own districts and suspicious of anyone of another color. Koru, the titular Last Tinker, is a young boy who lives in the outer districts of the city with his best friend Tap. When the city is overrun by The Bleakness it is up to Koru to fight back against the colorlesss force and restore unity to Colortown. It’s pretty obvious what City of Color is getting at. When the city was united each of the three people’s was recognised for a particular trait – the Greens were curious explorers for example- but now that they are divided those characteristics have mutated into their negative forms of fear, anger and depression. Koru must save the city not only by fighting the monsters of the Bleakness, but by restoring the people’s trust in each other and getting them to work together. The story is kept simple and sweet, and although the characters have to get by on cuteness and humor rather than personality, The Last Tinker is so packed full of positivity and good messages that it doesn’t matter. This is a game that is unafraid to stick its neck out and say good things about the world, and is a lovely pick-me-up in a world full of titles that tend to live on the grim and gritty end of the spectrum. Looking at screenshots for The Last Tinker it seems unlikely that Assassins’s Creed and Rocksteady’s Batman would play any part in it. Surprisingly both the combat and movement systems draw from those two “grown up” titles. That said neither of these systems is as complex or polished as those found in AC or Batman- to be expected from such a small title. The combat system riffs on the tricolour design theme. 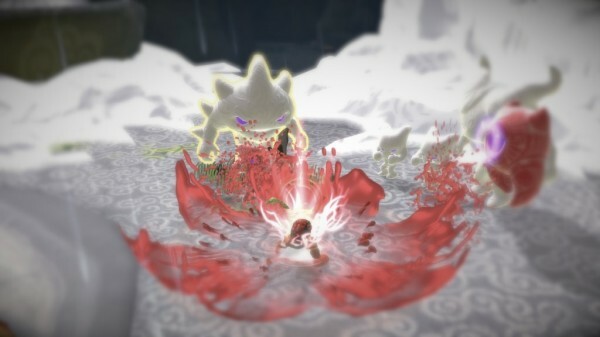 Koru meets up with three colour spirits throughout the game, each granting him a standard move and a special power relating to their personality. At first Koru only has Red’s punch and damage enhancing rage mode, with the move-set fleshed out by a dodge and very basic counter (hit the other dude first). As in Batman, enemies telegraph their attacks via exclamation mark, and Koru’s moves can be strung together whilst he moves from enemy to enemy. The basic set up is fun, but greatly enhanced when the other color spirit moves are unlocked- it’s a real shame that you don’t get much of a chance to play with the full set. Seasoned gamers will find The Last Tinker’s normal difficulty an easy task, but luckily there are a great range of difficulty options available that ensure the game can be tailored to anyone- there’s even a colour-blind mode. Whist the combat can be tweaked to suit a player’s skill level, the platforming and exploration is locked down at easy. There is no such thing as the jump button in The Last Tinker, leaving Koru to move around the world in freerun fashion. Whilst this gives things a nice flow the auto jump does kill most of the platforming challenge, making it possible to fly through sections by holding down a button and moving the control stick. The odd challenge can arise in sections requiring some timing and the level design has some fun moments, but from a grown gamers perspective the platforming gameplay isn’t much of a selling point. There are a couple of collectibles to spice things up though: floaty paintbrushes and colorful gems. In good ol’ adventure fashion you can smash crates and crystals to collect the gems inside (touching water is a death sentence too, whilst on that note). These can be spent on new moves and upgrades at the Dojo booths scattered throughout Colortown. The unlockable moves open up the combat system considerably, allowing for more powerful attacks or larger areas of effect. In addition to picking up gems there are also a handful of Floaty Paintbrushes hidden throughout each scene. Tracking them down isn’t particularly difficult, but they can be used to unlock various visual quirks (big head mode, mirror etc.) and modes (God mode)- which is another nice flashback to the 3D adventures of old. The two mushroomy gentlemen in the above screenshot form my favourite part of The Last Tinker’s gameplay- the puzzles. They are Bomber and Biggs, and they both respond to Koru’s colorful powers in different ways. As the name would suggest, Bomber is a tad explosive, whilst Bigg’s size is his advantage. Mushroom beds throughout the game allow either of these two to pop up, and special flowers can be used to switch between them. They allow for a lot of different puzzles that add to the non-combat portions of the game, and the faces that they make throughout are priceless too. 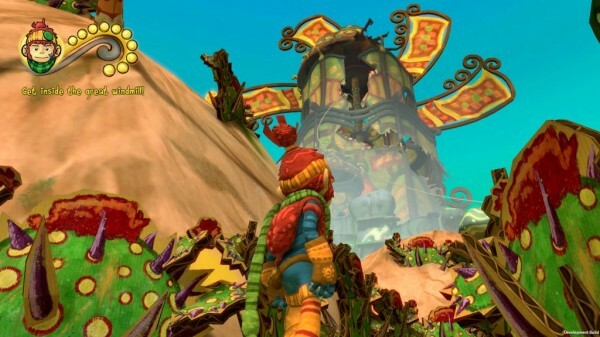 Bizarre little characters like Biggs and Bomber are par for the course in The Last Tinker, along with an endless parade of bright colours and vibrant landscapes. The three color theme echoes throughout the presentation, with three themed districts home to the three differently coloured inhabitants. The Greens are a strangely appropriate combination of tortoise and bunny, whilst the pudgy bears of the Blue district laze around in an almost Parisian night scene. Little touches here and there hint at Colortown’s crafty origins- the characters speak in cardboard cutout speech bubbles and Koru begins to lose his colour when low on health. Some of the characters are ever so sweet, and I never failed to enjoy watching Tap fly off into the distance trailing a rainbow of confetti behind him (the game’s equivalent of a map marker). The Last Tinker’s soundtrack is what first prompted my Spyro the Dragon association. It’s upbeat and full of energy, with bouncy guitar right at the front of it all. It does have its dark moments when Koru is in combat and the like, but for the most part it ramps up the joyous atmosphere of Colortown and is a delight to listen to. The lack of voice acting enhances that feel too, with the characters speaking in Animal Crossing style squeaks and noises. The characters just scream out to be plush toys, and if there is ever a plush of Tap I will be first in line. 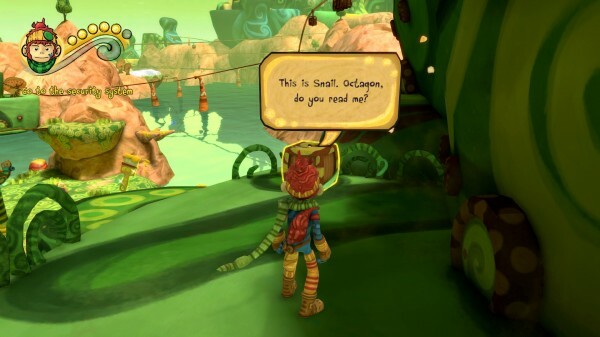 The Last Tinker is incredibly endearing, and whilst it is skewed to a younger gamer there is considerable effort made to give the grown ups something to enjoy. It’s characters and setting are bursting with color and charm, and the messages at the heart of it’s story manage to get across without ever becoming too serious or saccharine. 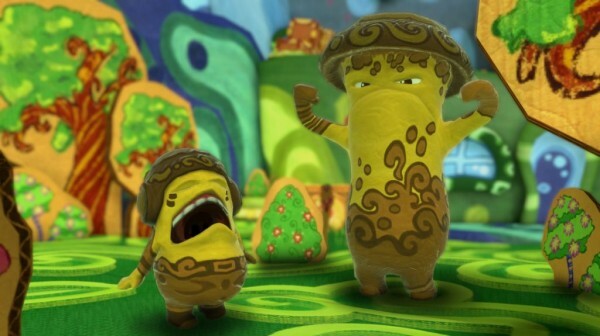 Whilst the gameplay has some shortcomings for older gamers kids will have a ball with Koru and Tap, and the whole thing is just so infectiously optimistic that even the cynical adults out there may find themselves drawn in.